Ask RP Photonics for advice on how to calculate ABCD matrices, which software to use, etc. 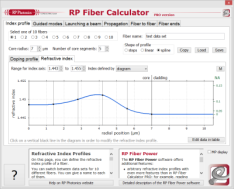 RP Photonics has the RP Resonator software for such purposes. An ABCD matrix or ray transfer matrix  is a 2-by-2 matrix associated with an optical element which can be used for describing the element's effect on a laser beam. It can be used both in ray optics, where geometrical rays are propagated, and for propagating Gaussian beams. The paraxial approximation is always required for ABCD matrix calculations, i.e., the involved beam angles or divergence angles must stay small for the calculations to be accurate. Figure 1: Definition of r and θ before an after an optical system. where the primed quantities (left-hand side) refer to the beam after passing the optical component. The ABCD matrix is a characteristic of each optical element. This shows that the offset r remains unchanged, whereas the offset angle θ experiences a change in proportion to r.
which shows that the angle remains unchanged, whereas the beam offset is increasing or decreasing according to the angle. Further examples for ABCD matrices are given below. For situations where beams propagate through dielectric media, it is convenient to use a modified kind of beam vectors, where the lower component (the angle) is multiplied by the refractive index. This can somewhat simplify the ABCD matrices for certain situations. The following list gives the ABCD matrices of frequently used optical elements. with Re = R cos θ in the tangential plane (horizontal direction) and Re = R / cos θ in the sagittal plane (vertical direction). Various textbooks (see e.g. Ref. ) specify the ABCD matrices for other types of optical components. If a beam propagates through several optical elements (including any air spaces in between), this means that the (r θ) vector is subsequently multiplied by various matrices. Instead, a single matrix may be used, which is the matrix product of all the single matrices. Note that the first optical element must be on the right-hand side of that product. It is often of interest how a laser beam propagates through some optical setup. Both the geometric path of a ray and the evolution of the beam radius can be calculated. The changes of beam parameters within one complete round trip in a resonator can be described with an ABCD matrix. The transverse resonator modes can then be obtained from the matrix components. An extended algorithm, involving an ABCDEF matrix (a 3-by-3 matrix with some constant components), can be used for calculating the alignment sensitivity of a laser resonator . The ABCD matrix method should not be confused with a different matrix method for calculating the reflection and transmission properties of dielectric multilayer coatings.